Equine infectious anaemia (EIA, also known as swamp fever) is a viral disease of horses transmitted by blood-feeding insects and caused by a Lentivirus (RNA virus) of the Retroviridae family (Orthoretrovirinae subfamily). It is not transmissible to humans. The disease can affect all equidae, thus including not only horses but also donkeys, mules and hinnies. The disease is transmitted through contact with infected blood, and thus generally by blood-feeding insects (horse flies and deer flies), which act as mechanical vectors only. The main vectors include the stable fly (Stomoxys calcitrans) and various species of horse fly from the Tabanus spp. and Hybomitra spp. genuses. Transmission peaks in the summer and autumn, when these insects are most active. Transmission can also be iatrogenic, through the use of contaminated veterinary needles and instruments or transfusion of blood from infected animals. The virus persists in the leukocytes of infected animals for life. Animals showing signs of the disease are more likely to transmit it, as they have a higher viral titre than animals with an inapparent infection. Equine infectious anaemia virus (EIAV) can also be transmitted through the placenta from an infected mother to her fetus, or through her milk in the first months of life. In animals under six months old born from infected mothers, serological positivity may be due to the presence of colostral antibodies. Equine infectious anaemia is prevalent worldwide. It has been reported in America (Brazil, Canada, Colombia, Paraguay), Asia (Japan, Malaysia, Mongolia), Europe (Belgium, France, Germany, Great Britain, Greece, Hungary, Ireland, Italy, Romania) and Australia. After infection the virus spreads through the horse's body, causing damage to the immune system. The pathogenesis is not yet fully clear. In the early stages, the virus reproduces in monocytes/macrophages, thus avoiding the humoral immune response. Over a few weeks a high titre of immune complexes builds up. These settle on the glomerular membranes and small vessels of other tissues, causing glomerulonephritis and vascular damage. Complement and neutrophil activation also causes vascular damage as well as platelet aggregation, intravascular coagulation and circulatory disorders. The anaemia is due to the fact that the viral antigens may be soluble and be released in the blood, adhering to the red blood cells. Specific antibodies then bind to the red blood cells, activating the complement and triggering haemolysis. This is known as immune-mediated haemolytic anaemia. In the bone marrow, the virus can cause reduced erythropoiesis as well as affecting plasma iron turnover. Acute: An intermittent or remittent fever above 40° C is typical. Other signs include marked muscle weakness, staggering gait, and tremors, with jaundice or reddening of the mucosa, strong heartbeat, tachycardia and arrhythmia (myocarditis). Oedemas may form in the lower part of the body. Widespread petechial haemorrhages are generally found in the sublingual area. Anaemia, which presents after a short time, is due to haemolysis and a lack of platelets (thrombocytopenia). Appetite is normally good even in severely affected animals. There have been cases of sudden death. Deaths are common with particularly aggressive strains of the virus. Complete recovery is rare; persistent intermittent attacks of fever are more usual. Chronic: signs include fatigue, reduced performance and weight loss despite a good appetite. Physical effort is normally followed by fever. Horses at rest often only present a slight rise in body temperature in the evening. Central nervous system signs such as apathy and depression are not uncommon. The outcome is highly varied: the horse may recover completely, although remaining a carrier. However, progressive weight loss and fatigue are more common. Subclinical: The infection is not apparent and the course is completely asymptomatic. The main lesions include enlargement of the spleen, liver, and lymph nodes (especially the abdominal lymph nodes). The mucosa may be pale and there may be emaciation in chronic cases. There may also be oedema, widespread petechial haemorrhages of the internal organs (spleen and kidneys), haemorrhages, and thromboses. Equine infectious anaemia can be diagnosed through serological tests. Infected animals remain carriers and serologically positive for their entire life. The most common diagnostic tests are Coggins AGID and immunoenzymatic tests (ELISA), performed according to the OIE manual (OIE Terrestrial Manual, Equine Infectious Anaemia. Chapter 2.5.6 2008). 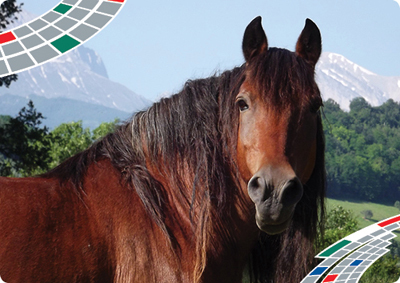 Coggins test is the official test used for surveillance in Italy and is the test recommended by the OIE for international trade in equidae. Both methods (Coggins and ELISA) provide accurate diagnosis of infection in horses, but can give false negatives in the early stages, where there is a low antibody titre, or more rarely in the acute form, when the circulating virus is capable of neutralising the antibodies in the blood. Polymerase chain reaction (PCR) is used to detect proviral EIAV DNA and for confirmation of serological tests, testing of foals born from infected mothers, and control of seropositive animals. As no vaccines are currently available, the disease is controlled by preventive measures, based essentially on serological testing and isolation of positive animals. Regular treatment to reduce the population of insect vectors in stables and stalls and good hygiene in the use of veterinary instruments are essential measures to limit exposure to infection. Like all enveloped viruses, EIAV is rapidly inactivated by the most common disinfectants.